Since the late fall of 2016, Democrats and other Leftist types have been decrying President Donald J. Trump as “not normal” and a “threat to democracy.” Of course, this is hogwash of the most rank sort. The same people lambasting Trump for his supposed “authoritarianism” are the same people who have created the modern American oligarchy. Tucker Carlson, the popular Fox News who wrote the single most brilliant and prescient Main Stream Media article on the Trump phenomenon: Donald Trump Is Shocking, Vulgar and Right | And, my dear fellow Republicans, he’s all your fault,by Tucker Carlson, Politico, January 28, 2016. That was written before, let it be noted, Trump’s double-digit triumph in the New Hampshire primary—has continued to speak verboten things. Now he takes aim at America’s oligarchic class in his just-released book Ship of Fools: How a Selfish Ruling Class Is Bringing America to the Brink of Revolution. For Carlson, moral and social rot in the United States starts at the very top—the place where Democrats and Republicans https://vdare.com/posts/they-want-to-lose-gop-congress-sounds-retreat-on-border-wall-funds-democratic-priorities to maintain unpopular elite rule. Carlson compares this American elite to blind drunk captains steering a sinking ship. Making matters worse: the fact that, in keeping with Carlson’s nautical parallel, “Anyone who points out the consequences of what they’re [the elite] doing gets keelhauled.” Gavin McInnes (banned from Twitter) and Alex Jones (banned from everything) would agree. Ship of Fools is no apology for Trumpism. Indeed, Carlson calls Trump “vulgar and ignorant.” But he rightly points out that Trump “didn’t invade Iraq or bail out Wall Street. He didn’t lower interest rates to zero, or open the borders, or sit silently by as the manufacturing sector collapsed and the middle class died.” Basically, Donald J. Trump is not your average American politician. Thank God. 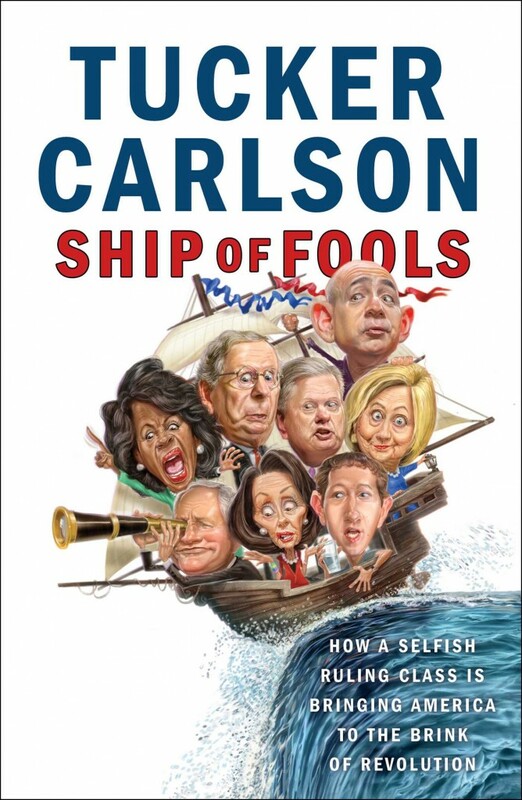 For much of Ship of Fools, Carlson comes off sounding like someone with his heart in the center-left. Some cheeky Twitter users might even dub Carlson’s latest book National Bolshevism. Why? Well, Ship of Fools excoriates finance capitalism and the class that has constantly reaped economic benefits out of the labor of American workers without contributing anything of substance to the American body politic. The Democrats used to be the party of populist rabble rousers like Huey Long and Al Smith. But Carlson points out that “the Democratic Party is now the party of the rich.” Rather than attacking mega-wealthy people like Amazon’s Jeff Bezos or Apple’s Tim Cook, the modern American Left is completely in thrall to money and corporate power. This hurts every American not in the upper income bracket. Republicans are no better. They remain wedded to the idea of being the party of business, and as such many Republican elected officials support Open Borders because that would provide their donors with an endless supply of cheap labor. This support comes at the cost of angering a majority of Republican voters. In sum, both parties have given up on the native-born American workers. And, beginning in 2016, American workers began pushing back at the ballot box. Ship of Fools is a bleak book. It is also much better than the usual fluff penned (or signed) by Fox News pundits. Carlson tells uncomfortable truths and engages with topics that until very recently were only considered fit for the fringe Right (like VDARE.com). 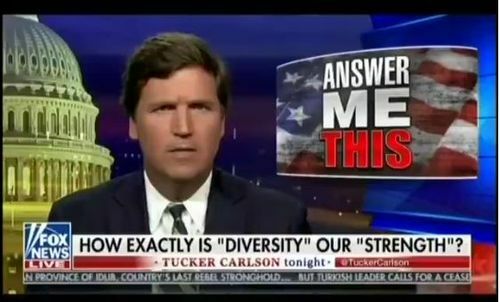 And, as anti-white vitriol increases and whites are demoted from majority status, Carlson predicts that white interest groups will form and flex their muscles when they feel that their backs are up against the wall. At several points in Ship of Fools, Carlson sincerely grieves for the lost Liberal-Left of his childhood. He misses the environmentalists who cared about littering, not about some abstract thing called climate change. He misses those Leftists who cried about injustice in the world rather than ranting and raving at the behest of the elite class. Without an honest Left, America could further descend into corporate anarcho-tyranny—a place where businesses control free speech and only a small sliver of people enjoy the benefits of the modern and high-tech economy. Ship of Fools ends with a warning: either practice democracy or be prepared for authoritarian rule. Explicit in this critique of America’s Ruling Class is the fact that democracies are unstable and prone to self-destruction. In modern America, the elite do not attend to the population, cynical race-mongering is used to win votes at the cost of internal peace, and chicken hawks like Max Boot and William Kristol still receive adulation in the Main Stream Media despite their disastrous record of cheering on military misadventures that kill thousands of Americans. (To say nothing of their fanatical opposition to Trump—despite the fact that he won the presidency when their catspaws McCain and Romney ignominiously failed). Ship of Fools correctly notes that this is what an empire looks like in its final days. In this sense the elites may be right to characterize President Trump as a populist. After all, Julius Caesar gave the common man order, security, and bread in the face of a cold and sterile system. By attempting to dismantle the elite consensus, Trump, Trumpism, and America First may just be the first entries in a new age of all-American Caesarism. We should only be so lucky!